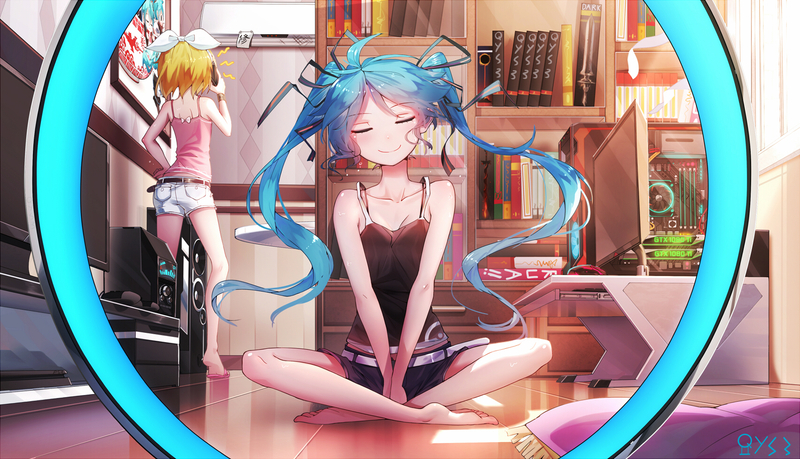 The blue-haired main protagonist. 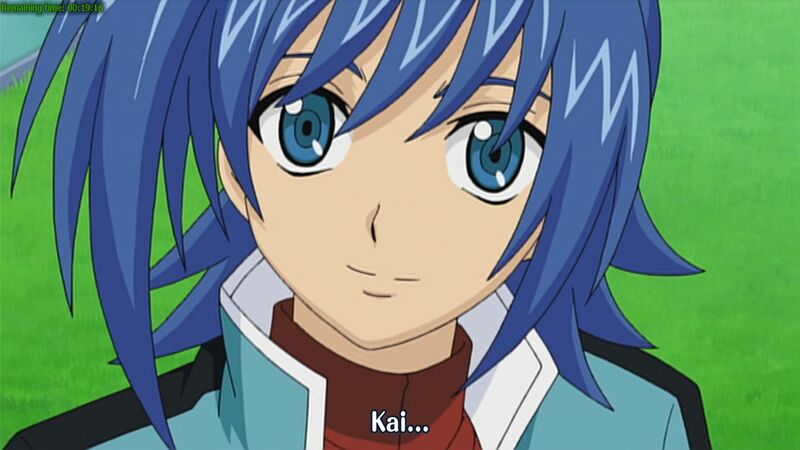 His name is not Kai though. Cardfight!! Vanguard is a series I’ve glimpsed in a satellite channel I’ve subscribed to but rarely watched, Animax Asia. From the few episodes I’ve watched, I decided to get the whole shebang and watched it from the start to the finish, all 65 episodes of them. This is a 2011 title, therefore it will challenge Tiger and Bunny for the ‘Anime of the Year 2011’ title, but this series’ quest for glory will be made harder because the sport genre standard handicap will be applied here. 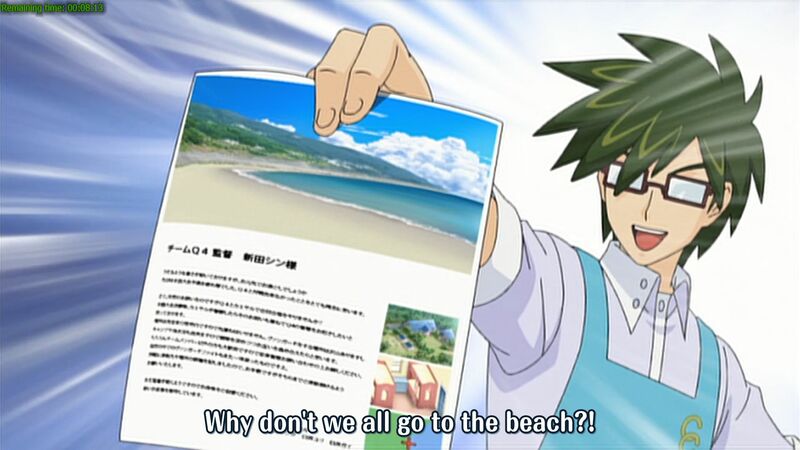 This series has a beach episode too. I wonder if it can be mentioned in the same breath as the Highschool of the Dead OVA is. …as well as quirky ones. For the purpose of this review, knowledge of how the card game works is essential, but I don’t really feel like explaining them. What is important for you to know is how a match’s result usually decided though. In the Vanguard card game, in almost all scenarios, when the competing two players are roughly equal in skills, tactics’ execution and deck constructions, the result will always be determined on which player has the most luck when it comes to drawing trigger cards. Actually, this anime even admitted it as such. In other words, luck plays a hugely disproportionate role in determining a match’s result. Skills only comes to the fore only if the participants isn’t on the same level (skill + tactic + deck construction), an occurrence that is not exactly common in this title. What this means here is that the major directions of the storyline are determined by the most important plot device in this series: the 4 Vanguard trigger cards. Personally, I think the writer uses this plot device very well to steer the direction of the main plot the way he/she wanted it. 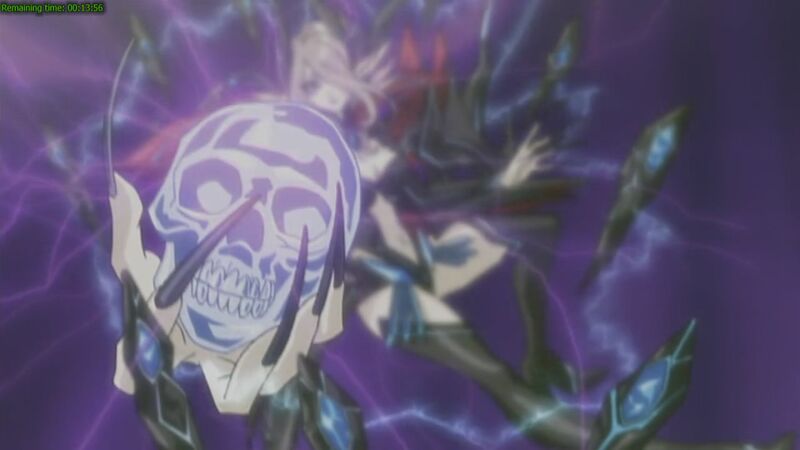 As you may suspect, the trigger cards is a fertile source for deux ex machina moments (the third battle of the finale is such a fine example of this) but the writer really minimized the damage that such moments can do to the series. As for the story itself, it is quite decent but not exactly a masterpiece. It is your standard ‘I wanna be stronger’ plot common for the genre if when its protagonist is a complete newbie at the start of the series. What grates me about the storyline the most is the existence of a couple of forced drama scenes (an example can be seen in the above screenshot) and also the tendency to insert flashbacks exactly at junctures where it isn’t needed. The latter in particular has the additional effects of disrupting the flow of the plot and also slowing down the pacing, at a time when the pacing should have been quicker. And I do mention that the flashbacks are annoying right? While the pacing in the general storyline of this anime could have been much, much better, the in-game and in-tournament pacing is largely excellent, with only some minor blips. Thankfully, those scenarios makes up the majority of this anime. Unnecessary match-ups are not shown at all, especially those that didn’t involve the main protagonist and/or his team. Matches with less importance in it that involves him or his team are done quickly too, ensuring that the pacing didn’t suffer. More airtime is given on important matches, appropriately so. And as mentioned before, the flow of the storyline has been affected by those flashbacks thingy, and this actually affect both in-game/in-tournament moments as well as the portions outside of them. This anime has a second season; hopefully this aspect can be improved in the sequel. As for character development, a sport genre title will almost always excels in this aspect especially if the main protagonist is a complete n00b in the game that are being portrayed. 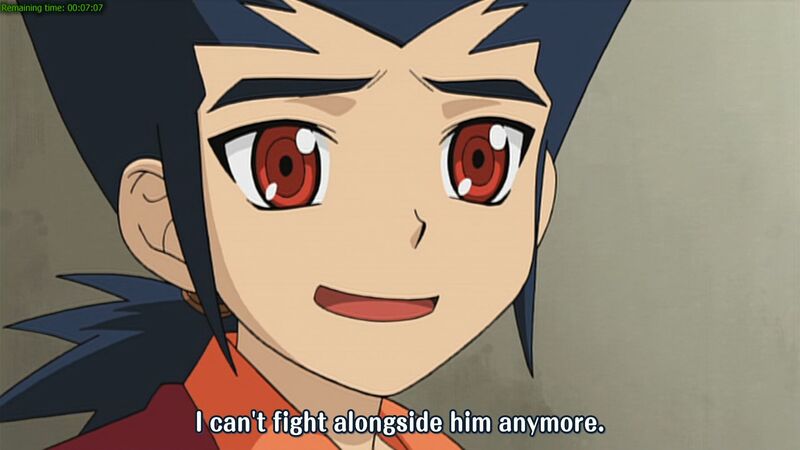 The same can also be said here, with the blue-haired main protagonist being the best character with his extremely extensive character development. The aforementioned surly white-haired card shop girl is another character that is almost on the same level as the main protagonist, while the latter’s love of his life is the sore exception in the team with his nearly static character development. The ending is decent and admittedly predictable, and it is written to accommodate a second season that is already airing. I wonder if Animax Asia will have that one or not. …and more of the fast-paced national tournament goodness. Character design in this anime is just your common shounen genre designs, orthodox ones if you ask me. Therefore, do not expect to see many black-haired characters in this anime set up in card-crazed modern Japan. Instead, the manufacturers of hair dyes are swimming in mountains of yen as people with blue hairs or white ones or more commonly, many shades of brown makes up the majority of the characters in this anime. The quality of voice acting in this anime is uneven. The blue-haired main protagonist and his black-haired future brother-in-law is just average, while the brunette and the white-haired card shop girl is just a little bit better than them. 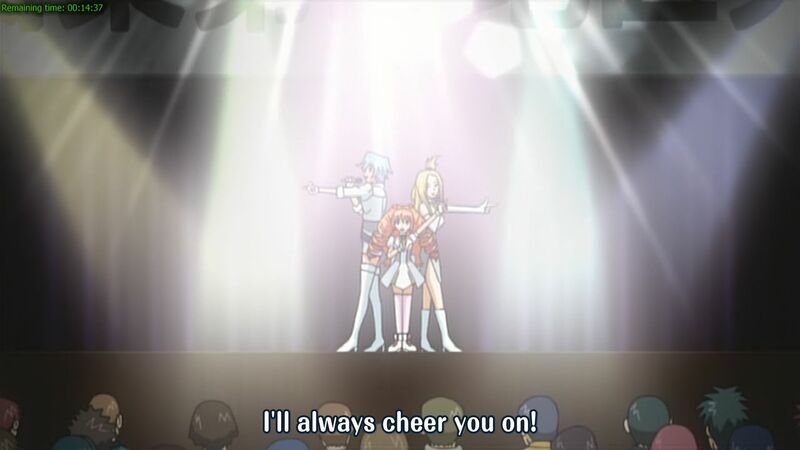 Three outstanding voice acting jobs in this anime belongs to the main protagonist’s little sister (has orange hair – dammit, it is orange), the redhead antagonist and also Daimonji Nagisa (another brunette). Thinking about that, the main protagonist sure sound better when he is in that SEED mode! This anime has done really well in this aspect. Not only the OST is decent, but the majority of the OP and ED themes are actually good. After the below average 1st OP and ED themes, all themes that follows them (2nd OP theme and 2nd, 3rd and 4th ED themes) are actually good. The blurry animation technique in action in this anime. 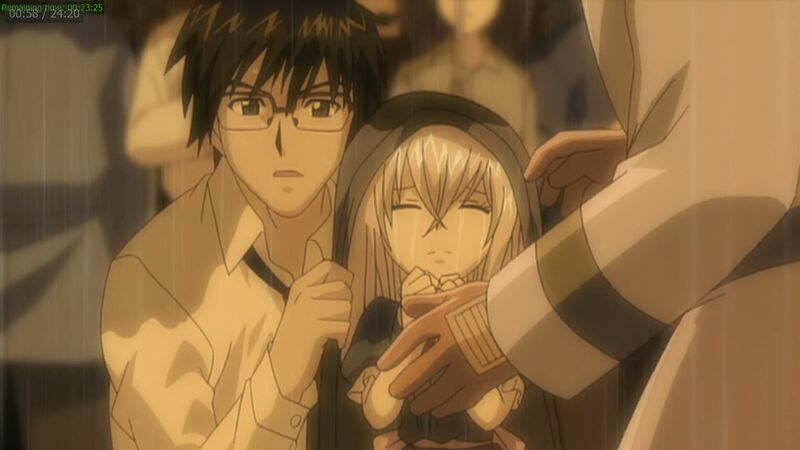 This anime used the blurry animation technique extensively throughout the series as illustrated in the screenshot above, mostly in fast-paced scenes. 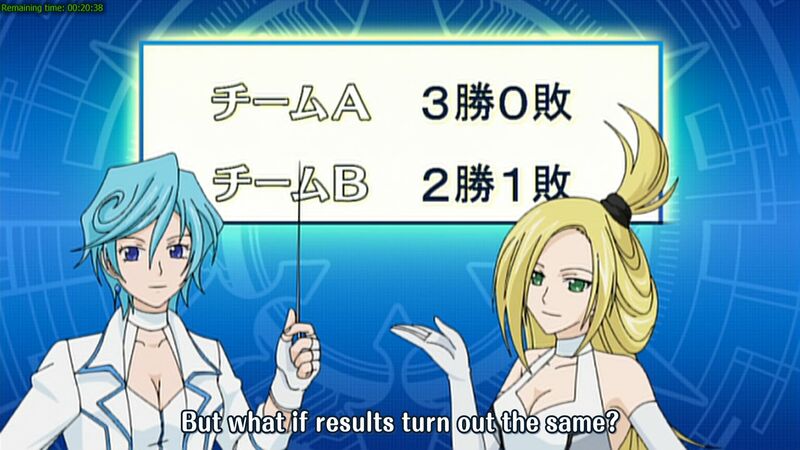 Therefore, one point will be docked from the final evaluation of this anime. Another complaint I have for this anime in this aspect is the poor character animation quality. I mainly refer to its atrocious character animation frame rate, which can be likened to a slide-show at its worst. This happens mostly outside card battles though, and not in them. Non-character animation quality is good, and so is the overall animation in in-game matches, even in fast-paced scenes. 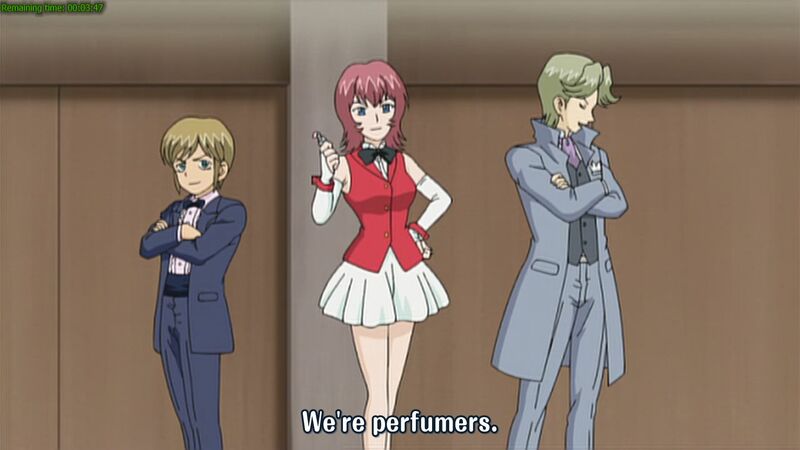 Choreography is just average though, what do you expect from a card game anime? The director can be credited for not resorting to the potentially finicky CGI animations and pacing management in in-game events. The staggered flow of the storyline is another matter though. 5 out of 10. The various handicaps this anime has really drag a reasonably enjoyable sport genre title down. Tiger and Bunny passed its second consecutive challenge very nicely as a result. Speaking about music, if I am the manager in charge of this idol group, I will make them go to plenty of choreography classes. 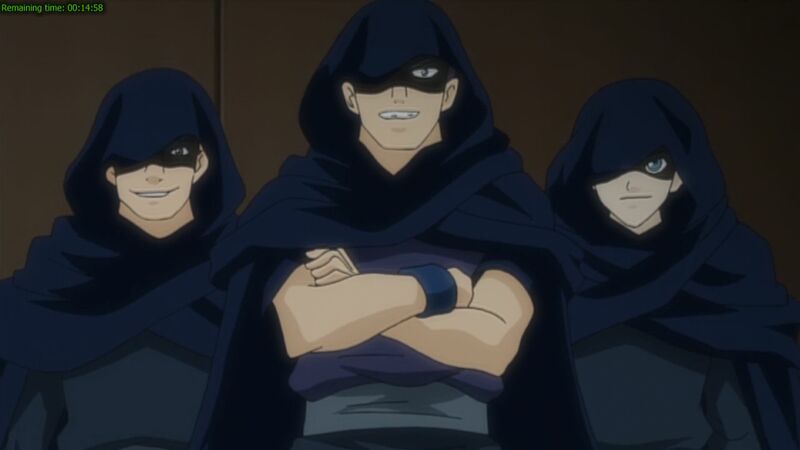 This is definitely the worst idol group in anime history.